Penny (above) used to jump on everyone and wouldn't mind. 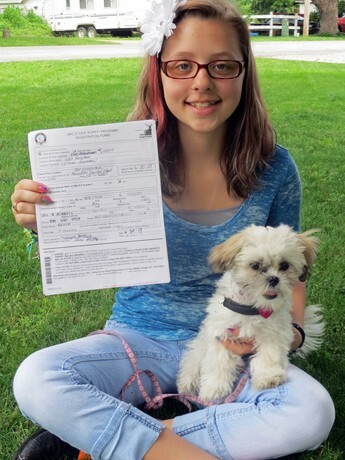 Now she is obedient and has passed her Canine Good Citizen Test and is a Certified Pet Therapy Dog. CLICK HERE to READ MORE Dog Training Reviews from other Dog Owners. 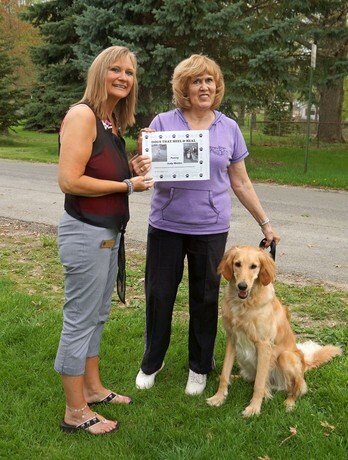 Lisa Freeman is a top Dog Trainer in Michigan (serving: Flint, Lansing, St. John's, Saginaw, Elsie, Ovid, Clio, Owosso, Corunna, Bancroft, Durand, New Lothrop, Laingsburg, Chesaning, Bay City, Midland, Freeland, Ann Arbor, Detroit, Jackson, Lapeer, Davison, Novi, Waterford, Howell, and more). Lisa is AKA as the Dog Whisperer in her community, where she specializes in behavior modification while teaching dog owners how to train a puppy or how to train a dog for obedience, pet therapy and service dog work. She offers AKC Star Puppy Classes, Canine Good Citizen Classes, Pet Therapy Dog Classes and Testing, Agility Courses, and Service Dog Training. 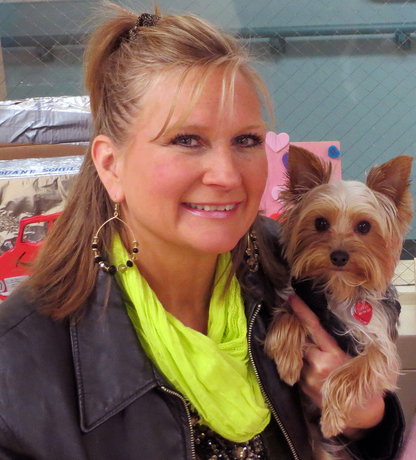 She is an AKC Evaluator and Certified Pet Therapist through the Love on a Leash Program with over thirteen years of experience in dog training, and has three dogs of her own. She works with dog lovers, dog trainers, and dog owners daily, on aggression and unwanted behaviors. Private Class AKC Star Puppy Graduate: Congrats Madison & Bella! Offered in Spring and Fall! Payment secures your registration/place in class. *Payment secures your registration/place in class. PRIVATE TRAINING / PRICES VARY depending on what pup/dogs need. $150-$175 per session-- I do a full 1 hour evaluation, always testing various forms of aggression (fear, territorial, dominance, pecking order, dog to dog, dog to human, etc) and teach owners how to break all forms of aggression and take the reigns and pack leadership back in their home through a series of safe, effective drills, depending on dog/behavior. I also offer obedience help and work on other behaviors if there is time. All pups/dogs who attend each class will learn all basic obedience and some advanced commands. They can choose to receive an AKC Star Puppy Certificate or Canine Good Citizen Award if they advance in all basic skills. All pups/dogs who attend each advanced class will learn skills to become a therapy and/or service dog and practice each of those advanced skills each week. At the end the AKC Canine Good Citizen test, therapy test, and public access test will be offered for those who have taken the class.